Lots of good places to sample Alsatian cuisine, beer and wine in Strasbourg. Here are the best restaurant areas in the center of Strasbourg (map). The sidewalk café-restaurants right in the Place de la Cathédrale and along rue Mercière leading into it from the west are superb for people-watching, but the ones along rue du Maroquin leading to Place du Marché-aux-Cochons-de-Lait are almost as good. There's great variety here. You'll find everything from ice cream cones, pastries and tea to fine dining. You should also stroll north out of place de la Cathédrale along rue des Orfèvres for its boutiques, bakery-pastry shops, cafés and gourmet food shops. At the other end of rue Mercière from place de la Cathédrale, place Gutenberg is less bustling than the area right in front of the cathedral, and thus a bit more relaxed for coffee, a drink and snack, or a full dinner. In summer, a carousel is set up for the children here. Down by the River Ill, southwest of rue d'Austerlitz, are several good restaurants along the quai St-Nicolas. In charming Petite France, look for restaurants— some with open-air terraces— right by the river in place Benjamin Zix and by the pont St-Martin. In all of these areas you'll find traditional French foods, but you'll also find wonderful examples of Alsatian cuisine. Be sure to try such local specialties as tarte flambée, a thin-crusted cousin of a pizza, topped with crème fraîche, onions, and lardons (bacon). 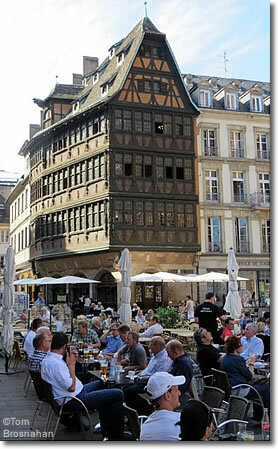 Above, Café-restaurants in the shadow of the Kammerzell in place de la Cathédrale, Strasbourg. 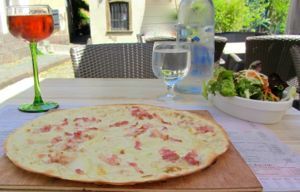 Below, Lunch of tarte flambée, salad, and a Riesling kir, by the river in the Petite France section of Strasbourg.